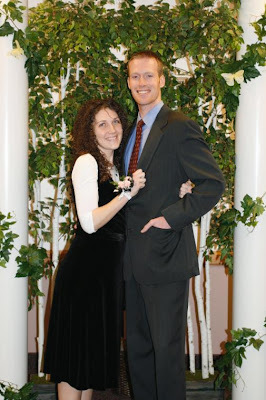 Jeff and I went to the stake Valentines dance this weekend. It was really a lot of fun dancing with him! Earlier that day I had taken a nap and when I woke up he was no where to be found but the phone book was open to the flower section of the yellow pages??? When he got home he presented me with a beautiful corsage and asked if I would go with him to the dance. I of course accepted and also proudly displayed it on Sunday. Thanks honey, you really know how to make me feel loved!! How romantic, you two lovebirds are! I remember hearing about the dance in Pocatello when you "doubled" with Celeste and Brent. It's awesome that you continue to enjoy dancing together. . . We're having our annual stake family dance next Friday night. We love you, Shelley and Jeff!